I HATE fire ants. Black ants are cool. They're alright in my book. But those reds...I just hate them. I regularly make sure to kill as many as possible when I find a one of their hills. Oh, and if you can't quite make out what their shirts say, its Exterminatrix. Yeah, I totally came up with that on my own. Lol lol lol lol lol. Best one in a while. I've noticed you've stopped using characters. like the penguins and soul snatchers and those cute little alien comics. 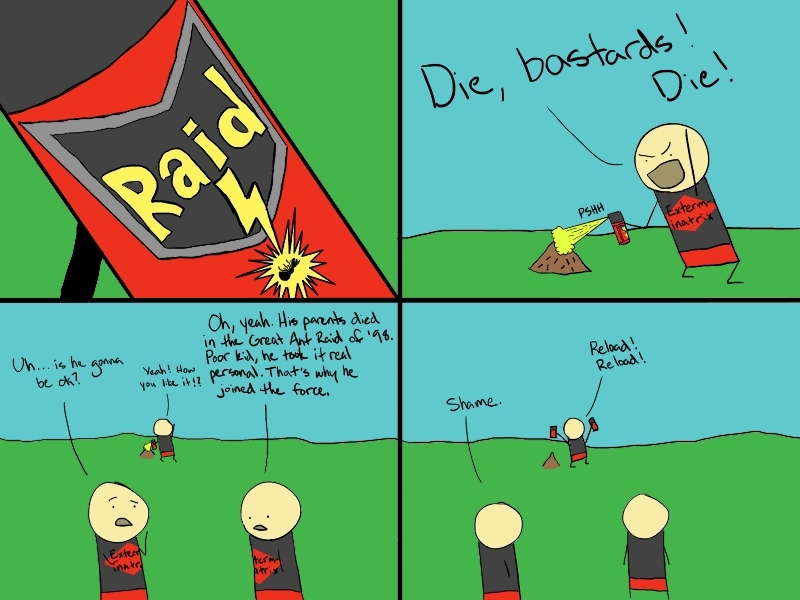 Lol, The great ant raid of 98! those where dark days indeed! @ gunkiderabbit: thanks! And yeah, I'm going to start again eventually, don't worry. And if you check the comicfury forum, I posted an announcement that I'm actually going to start a whole new comic about those cute little aliens called Cueballs. @ Tom Day: indeed, indeed, hundreds were trampled to death by the march of tiny feet.